If you grew and dried some gourds this year, or saved a few from fall decorating, then why not learn how to make a gourd snowman for Christmas? by Jane Lake and the Craftingals Yahoo Group. My husband brought in a gourd from his shop this week. He said he had grown it last year and had been meaning to bring it to the house, but it was a funny shape and he wasn’t sure what I could do with it. Well, as you can see, it made a lovely snowman! 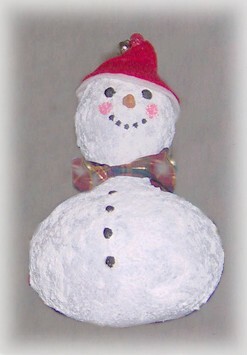 First, I painted the gourd with DecoArt’s Snow-Tex paint. It only needed one coat, which I allowed to dry for 24 hours. I used sculpey clay to form his eyes, mouth and buttons. The nose was painted with FolkArt’s acrylic paints #433 Terra Cotta nad #736 School Bus Yellow. The eyes, mouth and buttons I wanted to look like pieces of black coal, so I painted them with black acrylic paint. I then painted his rosy cheeks with a mix of red and white. I found the ribbon in my box of scrap ribbons and used red and white felt for the hat. I just stitched the hat by hand and attached a red tassle and bell.